In-O-Vate Dryer Products has been re-engineering your dryer venting needs for over 20 years. The most popular solution is the Dryerbox, which is installed in over 4 million homes. This simple metal receptacle allows you to locate the washer and dryer flush against the wall without crushing the hose. The long-turn 90 degree elbow and 45 provide run-length benefits to the builder and improved efficiency to the homeowner. For roof terminations, the DryerJack is specifically designed to achieve 100% airflow. DryerPlacards fulfill the trade's final inspection requirements by identifying the overall length of duct run. The award-winning LintAlert is a safety alarm that monitors and displays the back pressure in the dryer's exhaust and lets users know when blockage becomes an issue. To connect the dryer, the UL-listed DryerFlex transition duct is as flexible as slinky foil, yet maintains the same rigidity and airflow efficiency as traditional semi-rigid materials. 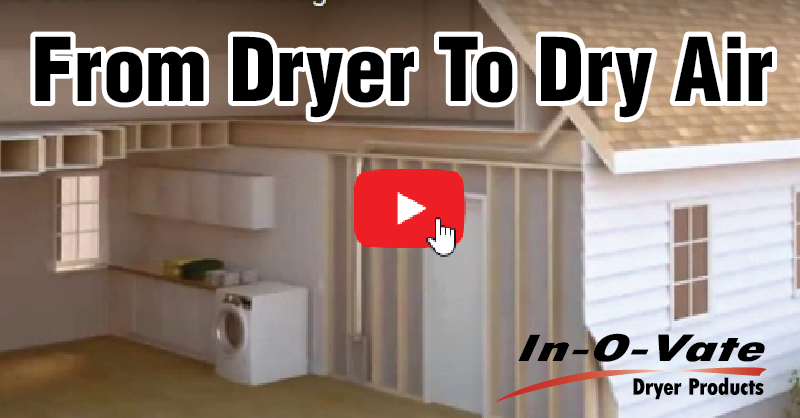 For venting downward, the down-box Dryerbox, coupled with a long-turn 90, is capped off with a flush design and code-compliant metal DryerWallVent. When used together, In-O-Vate's dryer venting solutions improve interior and exterior aesthetics and ensure your home is venting as safe and efficient as possible.